(a) Disconnect the R21 rear television camera assembly connector. 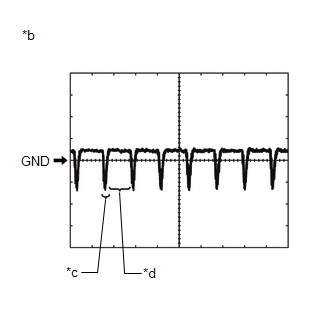 (b) Measure the voltage on the wire harness side connector according to the value(s) in the table below. If the result is not as specified, there may be a malfunction on the wire harness side. (c) Reconnect the R21 rear television camera assembly connector. (d) Measure the voltage and check for pulses at each terminal of the connector. A waterproof connector is used for the rear television camera assembly. 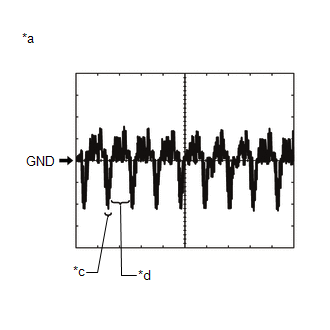 Therefore, inspect the waveform at the navigation receiver assembly*1 or radio and display receiver assembly*2 with the connector connected. If the result is not as specified, the rear television camera assembly may be malfunctioning. The video waveform changes according to the image sent by the rear television camera assembly. The video waveform is constantly output when the ignition switch is turned to ACC.